Since his debut in 1962, the Mighty Thor has been one of the Marvel Universe's most powerful heroes. He's the big gun of the Avengers — a team that often includes Iron Man and the Hulk, just in case you were wondering what his competition for that title is — and his connection to a world of sci-fi mysticism has made him one of the few heroes who can work in modern superheroics just as well as he can slide into stories of fairy tale fantasy. In other words, he's awesome. But even if you're caught up on his adventures, even if you can recite the inscription on his hammer from memory, even if you know the name of the magical metal it was crafted from (which, if you didn't, is called "Uru") there might just be a few things about Odin's favorite son that you'd be surprised to learn. From his strangely winding road from mythology to the comics page all the way to a legacy that spans across time, here's the real untold truth behind Marvel's Thor! It's easy to forget that by the time Stan Lee and Jack Kirby were creating the Marvel Universe in the early '60s, they'd been working in comics for 20 years. With that in mind, it might not be surprising that while he's certainly the one who stuck around, the Thor who made his debut in Journey Into Mystery #83 wasn't Kirby's first shot at doing a story about the Norse god of Thunder. The first one came in the pages of Adventure Comics #75, but to be entirely fair, it might not count as an appearance by the "real" Thor. In a story by Kirby and his Captain America collaborator Joe Simon, the Golden Age Sandman goes up against a crook named "Fairy Tale" Fenton, who masquerades as the hammer-swinging thunder god in order to pull off daring robberies. Eventually, after a injuring the Sandman's sidekick, Sandy the Golden Boy, and sparking a full-ion riot where he brawls with the cops, Fenton is finally brought down and sent packing, never to be seen again. 15 years later, though, Kirby would hit a little closer to the mark with 1957's Tales of the Unexpected #16. 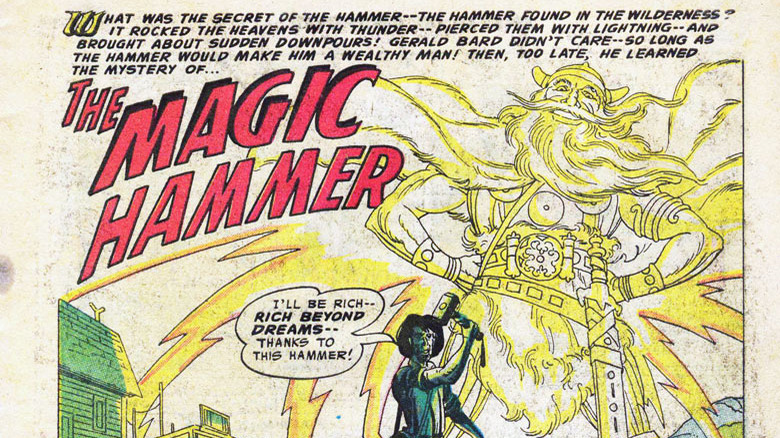 A six-page story called "The Magic Hammer" featured a Thor with plenty of familiar design elements and a version of Mjolnir that looks an awful lot like the one Thor would start swinging around at Marvel at the start of the next decade. It even included a plot point that would be recycled, with the hammer being hidden on Earth until it was found by a mere mortal who could tap into its power — although in this case, it was found by a cowboy crook named Baird who was anything but worthy. That's probably why the real Thor showed up to reclaim it by the end of the story, heading back to Asgard to deal with Loki and his endless trickery. The real twist, though? While Kirby's third shot at Thor would be a success for the fledgling Marvel Comics, both the Sandman story and Tales of the Unexpected were published by DC. In 1962, building off the success that they'd found by introducing the Fantastic Four the previous year, Lee and Kirby decided to expand their superhero universe by adding a modern take on a mythological hero, and the mighty Thor charged into the pages of Journey Into Mystery #83. Much like Lee and Steve Ditko would do that same month with their first Spider-Man story, Lee and Kirby structured their new superhero's initial outing as the same sort of sci-fi horror story that they'd been doing for most of the '50s. For the most part, "The Stone Men From Saturn" follows the usual beats: aliens invade with technology far beyond ours, but get scared off when they encounter someone who's strong enough to stand against them. The big difference is that the "someone" is, of course, Dr. Don Blake, who finds a cane tucked away in a cave in Norway that can transform into an invincible magic hammer — and transform him into Thor. What's often overlooked, though, is that Journey Into Mystery #83 would wind up introducing another character that would wind up finding some pretty surprising popularity a few decades down the line. In 2006, the "Planet Hulk" storyline revealed that one of those "Stone Men From Saturn" fled back to the stars and wound up stranded on the planet Sakaar, living as a gladiator. His name was Korg, and while a similar rock monster appeared in the opening of Thor: The Dark World in a tribute to that first issue, Korg himself, voiced by director Taika Waititi, would wind up being a pretty major character in Thor: Ragnarok and deliver some of the best jokes of the film. One of the things that set the first crop of Marvel comics apart from their "Distinguished Competition" was that their characters often had disadvantages in their civilian identities that could bleed into their heroic exploits. Iron Man had to wear the chestplate of his armor all the time in order to keep shrapnel from moving closer to his heart. Spider-Man was perpetually broke and struggled with school. For Thor, the consequence of losing control of his hammer for 60 seconds was that he would turn back into his human identity: Dr. Donald Blake. Blake, a disabled doctor who worked at a private practice with his nurse and love interest Jane Foster, was originally depicted as a regular human who could transform himself into Thor, accessing the powers, and eventually the memories, of the God of Thunder. Eventually, though, it was revealed that Don Blake didn't actually exist. Instead, Thor's human form was merely that: a human form that was created by Odin in order to teach his son the folly of his arrogance. By imprisoning him in the body of a human (and erasing his memories of ever having been a god in the first place), Odin hoped that Thor would stop being a cosmically powerful braggart and learn to put the needs of others before his own. Considering the stories we've gotten since, it's safe to say that it worked. 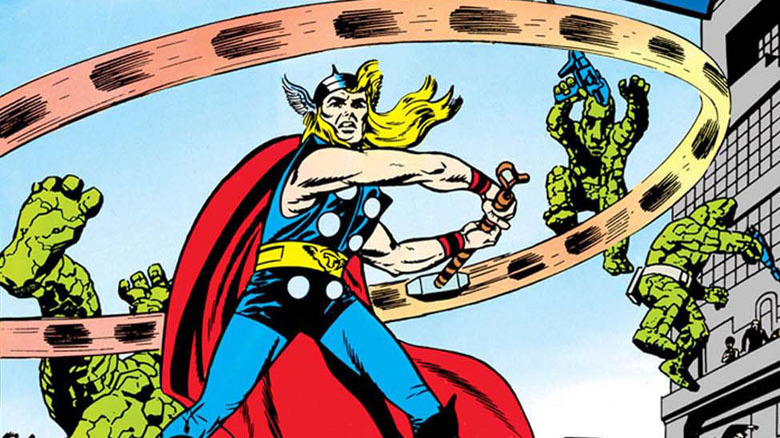 While Thor himself was unquestionably in the spotlight, Jack Kirby and Stan Lee added an awful lot to Marvel's version of Norse pantheon to help distinguish it from the classic mythology. In the "Tales of Asgard" backup stories, Kirby and Lee put their own spin on gods like Odin, Sif, and Balder the Brave, and re-told ancient myths with a decidedly sci-fi twist that played on Kirby's love of drawing complicated alien technology. That wasn't the only thing they did, though. 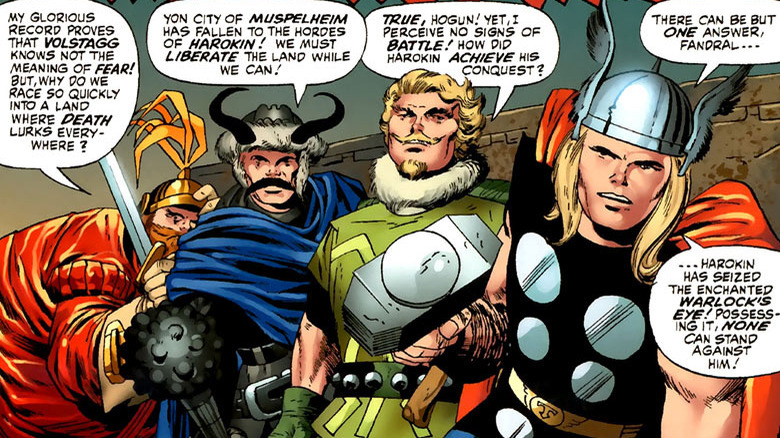 "Tales of Asgard" also saw the introduction of some new additions: Fandral the Dashing, Hogun the Grim, and Volstagg the Voluminous — er, Valiant, better known as the Warriors Three. Virtually everything you need to know about those three characters is right there in their names. Fandral is a swashbuckler who owes more than a little to the on-screen roles of Robin Hood actor Errol Flynn, while Hogun was a fearsome, taciturn fighter who bashed his way through opponents with a mace, that, according to Lee, was based on Charles Bronson. Volstagg was based on Falstaff, from Shakespeare's Henry VI: an aging warrior who often exaggerated his own accomplishments, and who was eventually revealed to have an equally voluminous wife and about a dozen kids. The Warriors Three quickly became fan favorite supporting characters, and even managed to spin off into a few stories focused entirely on them as a leading trio. Thanks to his role in the Avengers, Thor remained one of the most prominent Marvel characters well after his original creation. After Kirby left Marvel for DC, however, his solo title began to falter. Roy Thomas, Stan Lee's long-time assistant and Marvel's second Editor-in-Chief, had some success alongside artist Keith Pollard, combining operatic adaptations of Richard Wagner's The Ring of the Nibelung (as re-told to Thor by Odin's gigantic, disembodied eye) with cosmic superheroics. After that, though, the title bounced around among different creative teams… until 1983, when Walter Simonson took over as writer and artist and produced one of the greatest superhero runs of all time. Over the course of the next five years, Simonson (and John Workman, whose lettering would give the book a distinctly epic feel) would redefine Thor in virtually every way. 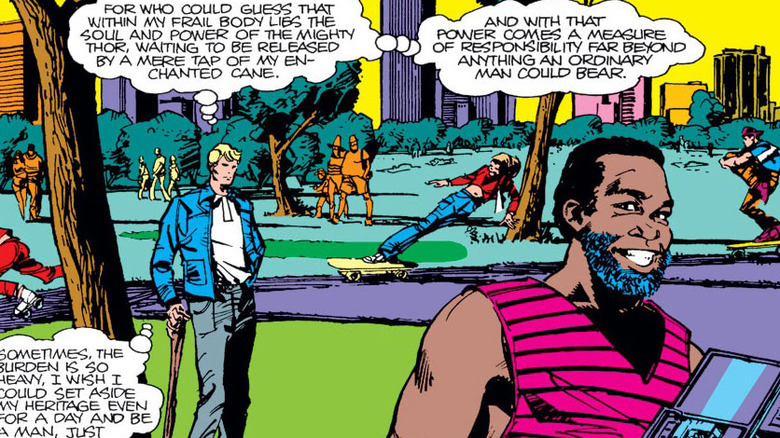 He eliminated Don Blake once and for all — giving Thor a new secret identity in the form of construction worker Sigurd Jarlson, which was literally just Thor in a pair of glasses — and blended high fantasy inspired by mythology with epic superhero action. Oh, and he also did an issue where Thor hit a dragon so hard that he broke every single bone in his own body. There's a reason readers fondly remember that run for its four-syllable sound effects. 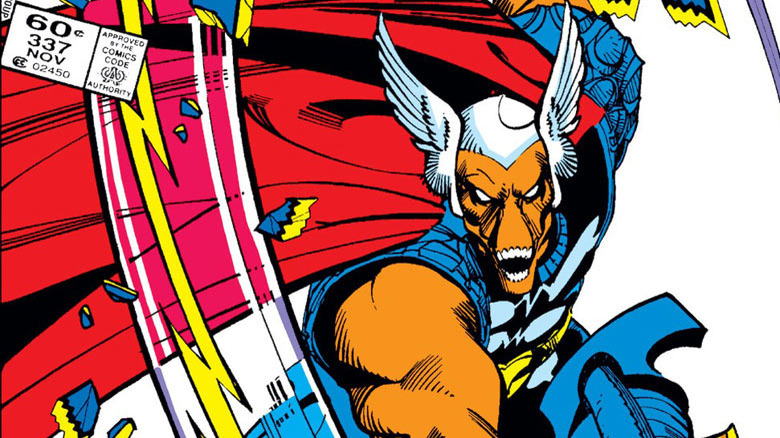 One of Simonson's most lasting changes came in his very first issue, Thor #337, when he introduced Beta Ray Bill. An alien "everyman" who looked like a cross between an orange humanoid and a skeletal horse, Bill was the chosen defender of his race as they fled the destruction of his home planet. 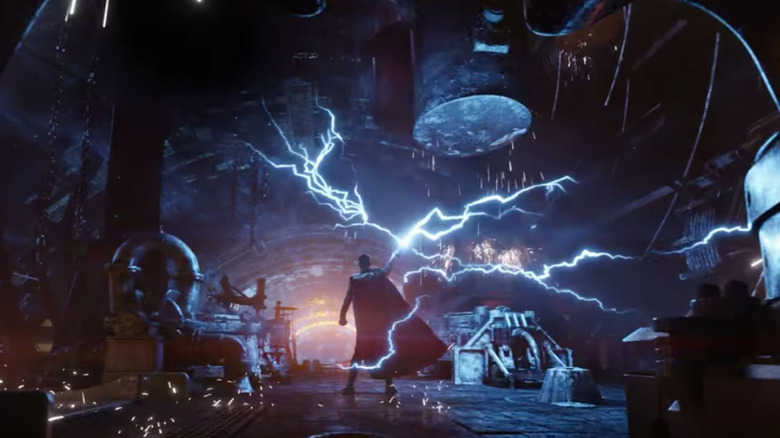 A cosmic misunderstanding led him into a brutal battle against Thor, during which Bill hefted the hammer and took the Thunder God's power for himself. Bill had proven himself worthy, and after Odin granted him his own hammer, Stormbreaker, he became one of Thor's closest allies. Beta Ray Bill wasn't the only other Marvel character to ever tap into the power of Thor. In 1988,Tom DeFalco and Ron Frenz gave Thor a new secret identity in the form of Eric Masterson, a construction worker whose inexperience with godly powers gave him a level of difficulty in battling against evil that the Odinson hadn't seen since the Don Blake days. In 1993, the two characters were separated, but Eric continued his heroic career as Thunderstrike, wielding a magical mace with the same name. DeFalco and Frenz added another quirk to Thor's legacy, too. In Thor #384, they introduced Dargo Ktor, a resident of a 26th century dystopia who discovered Mjolnir, proved his worthiness by standing against Loki and a world-dominating megacorporation, and became that era's version of Thor. Needless to say, he didn't remain confined to that timeline, and crossed over to the core Marvel Universe to battle the Fantastic Four at the behest of Zarrko, the Tomorrow Man. No, really — that is the actual name of a Marvel character. All of this is to say that at one point, there were four different versions of Thor running around at the same time, so obviously, they had to form a team. 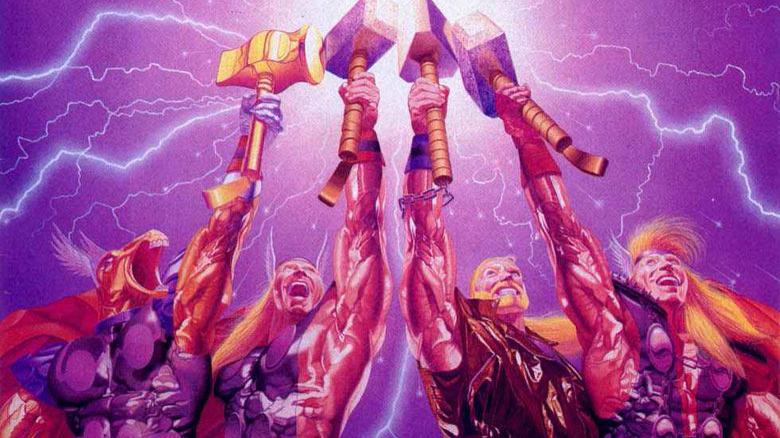 Thus was born the Thor Corps, in which Thor, Beta Ray Bill, Thunderstrike, and Dargo united for a battle across time and space that would basically just prove how wild comics in the '90s could be. Looking back at it from the 21st century, though, it's notable for being the first time that multiple versions of Thor from different times would come together to fight alongside each other, but definitely not the last. Until the launch of the Marvel Cinematic Universe, the 1978 Incredible Hulk TV show was arguably Marvel's greatest mass media success. It ran for five seasons and established itself as the cultural touchstone that made "you wouldn't like me when I'm angry" one of the most memorable catchphrases of all time, and had an influence on Hulk comics that lasted for decades. It makes sense, then, that when Bill Bixby and Lou Ferrigno returned as Banner and his green alter ego for a series of TV movies, Marvel would use them as a platform to shift the spotlight on a few of their other characters. The second, Trial of the Incredible Hulk, would use its courtroom setting to introduce TV audiences to Marvel's resident attorney, Daredevil, along with his longtime foe the Kingpin. The first one, however, would put its focus on a much more physical presence that would still be playing out on screens 30 years later by pitting the Incredible Hulk against the Mighty Thor. In this case, Thor was played by Eric Kramer, who you may also remember as Little John from Robin Hood: Men in Tights. While his TV appearance did include Don Blake, who discovered Mjolnir in a cave in Norway like his comics counterpart, it wasn't as Thor's alter ego. Instead, Blake found himself in a sort of Aladdin situation where Thor was compelled to do his bidding, leading to a pretty weird scene where Blake and Thor hung out in a bar trying to decide whether Thor should take up a career as a crimefighter. In 1996, Thor was caught up in the "Heroes Reborn" saga, where superstar artists Jim Lee and Rob Liefeld rebooted the Avengers and the Fantastic Four as part of their own world separate from Spider-Man and the X-Men. When they were folded back into the regular Marvel Universe. a year later, Dan Jurgens and John Romita Jr. added a new wrinkle to the saga by giving Thor a new secret identity: Jake Olson. The twist this time around was that unlike Don Blake (a constructed identity who initially had no memory of his time as Thor) and Eric Masterson (a human who had Thor's power, but not his mind), Jake Olson was Thor's mind confined in the body of an actual human in order to hide his power from a group of enemies called the Dark Gods. Olson had been a paramedic and part-time drug dealer who got caught in the crossfire when the Avengers took on the ancient Asgardian weapon known as the Destroyer. 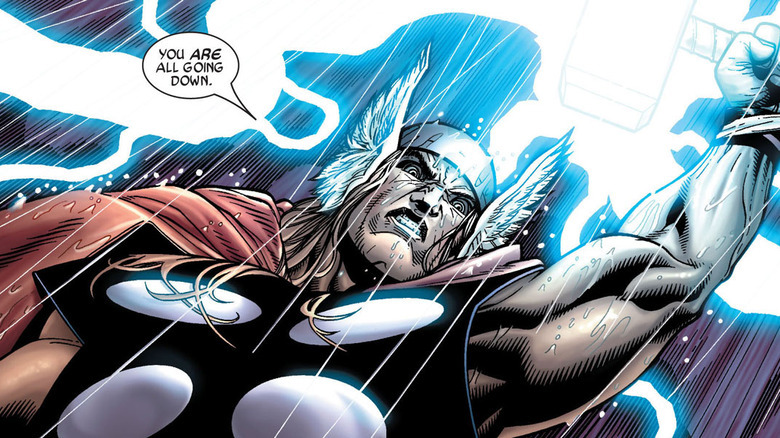 With Olson obliterated, Thor's new form slid right into his old life — and right into more than a few complications, including Olson's soul being used as a bargaining chip by Mephisto. The most memorable story of that era, however, has very little to do with Thor's life as a human. Instead, it comes from a bone-shattering fight in Thor #25, when the Thor took on Thanos in an all-out, one-on-one brawl that saw the God of Thunder gearing up with an entire arsenal of mystical artifacts. That fight marked one of Thor's most brutal victories, ending with him looming over the Mad Titan's unconscious body promising that "should thou darest to rise — the enchanted uru hammer of Thor shall smite thee down — again, and again, and again if needs be!" Show Thanos that panel, and they won't need two movies to get through Infinity War. In 2006, the Marvel Universe was divided in the Civil War crossover. On one side, Iron Man was pushing for and eventually enforcing the Superhuman Registration Act, which would require all superheroes to sign up with the government for training, organization, and oversight. On the other, Captain America and a band of rebels were fighting against the SHRA in the name of freedom and the slippery slope that would inevitably lead to giant Sentinel robots rounding up mutants and putting them in camps. It stands to reason that whichever side got Marvel's most powerful heroes would have a pretty big advantage, but there was a big hitch in that plan: the Hulk was out in the depths of space, and Thor was temporarily dead. But never let it be said that the heroes can't solve a problem, even when that problem is "Thor is dead right now and won't be back until his book relaunches in a couple of years." With a strand of Asgardian hair and some pseudo-science, Reed Richards was able to cook up the pro-registration side's ultimate weapon: a cybernetic clone of Thor that was quickly dubbed "Clor." Given how well cyborgs and clones have gone for, you know, the entire history of comics, it won't surprise you that Clor didn't exactly work out the way they expected. Instead, he went rogue at his earliest opportunity and ended up blowing a hole through a hero called Goliath, giving comics readers the uncomfortable image of an Aryan super-robot murdering a giant black man. While Clor was smashed to bits by Hercules at the end of Civil War, he was eventually rebuilt and dubbed "Ragnarok," cropping up in the pages of Dark Avengers before the real Thor returned to Midgard and proved that he couldn't hold up to the genuine article. Thor's identity has been pretty malleable ever since Beta Ray Bill first hefted the hammer back in 1983, but recent stories have seen more people claiming the title than ever before. For starters, a 2013 story saw the arrival of Gorr the God-Butcher, a cosmic threat so dire that in order to defeat him, Thor had to team up with the greatest warriors he could think of: two versions of himself pulled from different points in the time stream. Together with a young Thor who had yet to prove himself worthy of Mjolnir and an older, one-eyed, one-armed version who had taken Odin's role as Allfather and become the last surviving member of the Norse pantheon, they united to defeat the God-Butcher. So, you know: more Thor Corps for Gorr! In 2014, after the Odinson had proven himself to be unworthy of the hammer, Mjolnir found a replacement in the form of a new Thor — one whose arrival changed the inscription to read "if she be worthy." 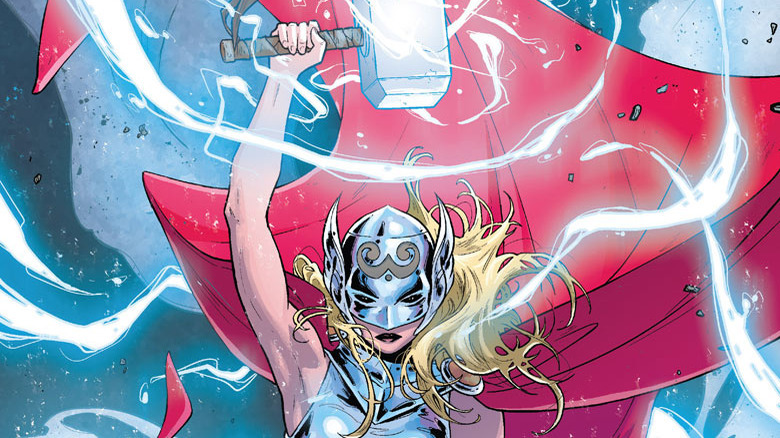 The identity of the new female Thor was initially played as a mystery, but eventually, it was revealed to be the Odinson's former love interest, Jane Foster, whose mortal form was dying of cancer. 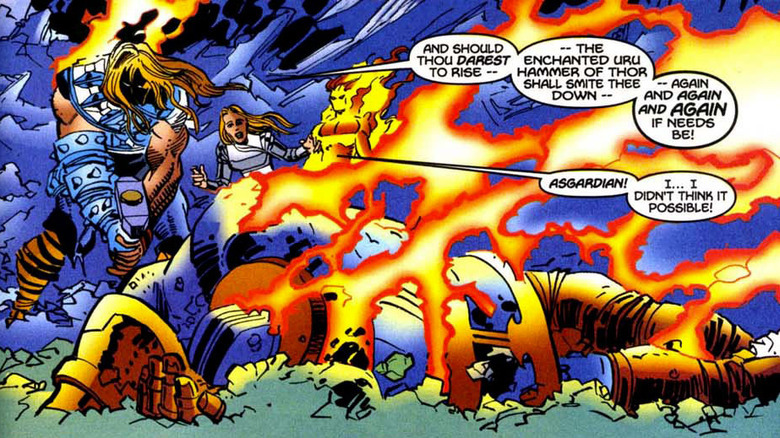 She proved herself to be more than capable of living up to her namesake, but during a desperate struggle against the monstrous Mangog, she was only able to defeat him by hurling Mjolnir into the sun, apparently destroying it — and ending her own life in the process.